Are you looking for a way to update any room in your house? Consider installing new tile floors with help from the professionals at Flooring America of Scottsdale. At our showroom, we carry an expansive selection of tiles in many different materials, shapes, colors, and even textures. From smooth porcelain to uniquely textured natural stone, we have the products that will add elegance and style to your living space. Our tile flooring installation and sales specialists are here to give you the advice and services you need throughout the entire process. From our sales professionals giving you important information about the differences between top brands to doing the complete installation, our goal is to ensure you love your new floors. 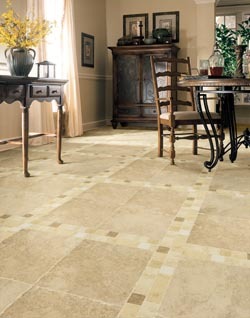 Visit our showroom to view many types of tile flooring in Scottsdale, AZ. We're happy to discuss your options with you or let you browse at your leisure. Does the air in your home ever feel dusty? There are many ways you can reduce allergens like dust and dander in your home, including investing in our tile flooring installation services. The glazing on our tiles repels liquids, dirt, and mildew. Spills and debris don't have a chance to sink below the surface. Instead, you can easily wipe them away with a damp cloth before they get a chance to cause mold growth or worsened allergies. In addition to the purifying properties of our ceramic and porcelain tile floors, they're also incredibly versatile in terms of design options. We carry a wide assortment of colors and sizes, allowing you to find something that matches your design preferences. We even offer tiles for showers as well as those for floors. And because we stock top name brands like Daltile, American Olean, and Marazzi, you always know you're getting a quality product. The beauty and longevity of your floors depend as much on the installation process as the quality of the materials. That's why you have nothing to worry about when you visit our flooring showroom. Not only do we provide durable and stunning tile flooring options--we also offer the installation solutions that optimize these qualities. We're so sure of our installation techniques that we cover our work with a Lifetime Installation Guarantee. Contact us today to learn more about our tile flooring products. We proudly serve the communities of Scottsdale, Arizona, including McCormick Ranch, Gainey Ranch, Pinnacle Peak, and Grayhawk.